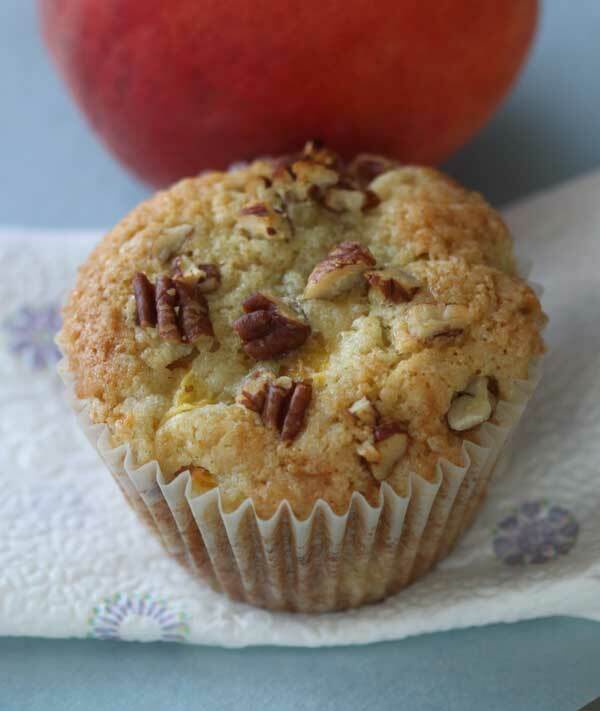 Peach Muffins topped with chopped pecans. This recipe halves easily if you'd prefer 6 muffins instead of 12. Preheat oven to 350 degrees. Grease 12 muffin cups or line with paper liners. In a mixing bowl, thoroughly combine dry ingredients and make a well in the center. In a second bowl, stir together eggs, oil, vanilla and almond extract. Add egg mixture to flour mixture and stir just until moistened. Stir in peaches. Divide batter among muffin cups and sprinkle nuts on top. Bake for 25-28 minutes or until the tops start to brown. For gluten free peach muffins, use 1 1/2 cups King Arthur Multi-Purpose Baking Mix and add 1 teaspoon xanthan gum.